Monaco's new coach Thierry Henry has named former Arsenal manager Arsene Wenger and Pep Guardiola of Manchester City as the two coaches who inspired him to become a coach. Recall that Henry was appointed Monaco coach last weekend. The 41-year-old signed a three-year contract with Ligue 1. 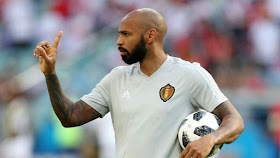 Henry said that Wenger and Guardiola inspired his coaching career because he learned a lot from them during his time as a player at Arsenal and Barcelona. FourFourTwo quoted Henry as saying, "I learned from those I worked with, whether they challenged me, or sometimes they did the wrong thing. "Arsene has unlocked so many things in my head - what it means to be a professional, how to play. "You learn from people, but you also have to bring in your own mix. "Pep for me is the reference, I've learned again how to play the game when I went to Barcelona under him. "With Pep, you can just talk about the game and he will not go to sleep, you'll fall asleep and he's still talking. "He's way ahead of the game," he said.